How Do I Pass a User or Multiple Users on a Training Assignment? 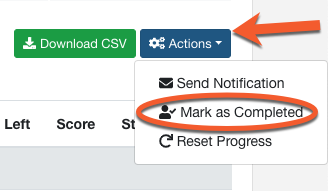 If you need to, you can "pass" one or more users on any training assignment in a training campaign, so their status will report as Completed. Training assignments include training modules, video modules, games, and policies. By policies, we are referring to policies uploaded under the Training > Policies tab. Policies that are attached to a course cannot be manually "passed", but a course with a policy attached can be passed. Navigate to the Campaigns tab under the Training section of your console, and click on the title of the training campaign. From the Campaign Overview screen, click the title of the training assignment you wish to "pass" the user(s) for. This will take you to a list of all enrolled users and their statuses on the training assignment. You can filter by Not Started, Incomplete, In Progress, Complete, or Past Due to find specific users (shown below). Select the checkbox next to the user(s) you wish to pass. If you wish to pass all users at once, use the top-level checkbox to select all users on the page. Click the Actions drop-down button at the top-right and select Pass Selected, as shown below. All of the users you selected will now show a Completed label in the Status column for this training assignment.